These are the premier BaseVac™ central vacuum systems. The industry leading engineers at BaseVac™ will design the system specifically to your needs. From rooftop installations to huge multi operatory clinics they have the solution to whatever unique situation you have. These systems are available as duplex and triplex systems, with additional capacity upon request. Except for the latter, all are expandable, using standard factory modules, up to a triplex. As with the tank mounted units, all come with the basic accessories; mounting, however, is vertical. Each pump is mounted on its own stand, which stacks, one above the other. Each pump is connected to a central manifold, which is plumbed to a vertical air water separator. These are the premier BaseVac™ central vacuum systems. 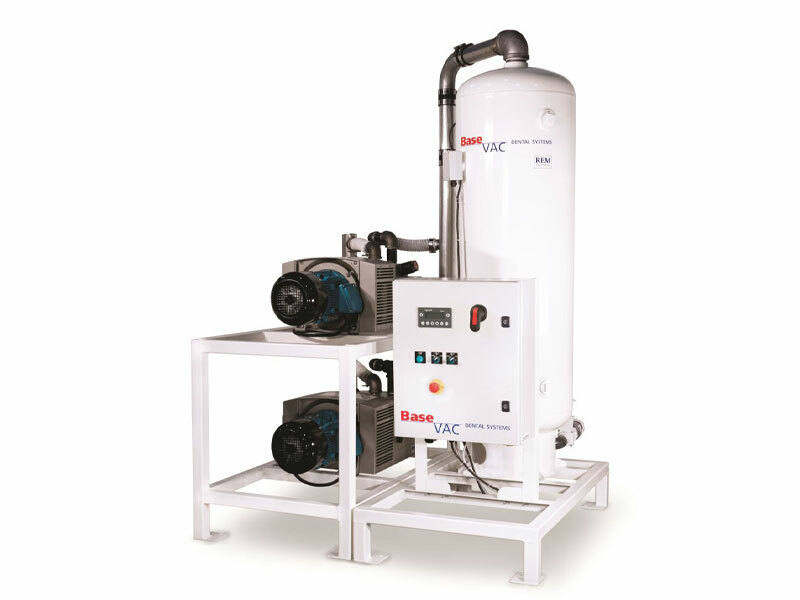 The industry leading engineers at BaseVac™ will design the system specifically to your needs. From rooftop installations to huge multi operatory clinics they have the solution to whatever unique situation you have. These systems are available as duplex and triplex systems, with additional capacity upon request. Except for the latter, all are expandable, using standard factory modules, up to a triplex. As with the tank mounted units, all come with the basic accessories; mounting, however, is vertical. Each pump is mounted on its own stand, which stacks, one above the other. Each pump is connected to a central manifold, which is plumbed to a vertical air water separator. The control panel employs a programmable controller to determine the operating sequence of the pumps. Automatically alternating lead/lag, or “cascading”, controls operate on a first-on/first off basis. This ensures that each pump will have approximately the same amount of running time. This evens the wear on all pumps and prevents the backup pump from deteriorating due to lack of use. Minimum run timers on all pumps prevent excessive wear on motors due to a high frequency of starts. The entire system can be upgraded with additional capacity by adding a pump and electric module. This can be performed in minutes with no interruption to the integrity of the vacuum system. Isolation valves are already installed for up to 3 pumps, and individual disconnects are provided for each motor. Since the system is vertically oriented, additional floor space may not be required. All service points are easily accessible without crawling over piping and pumps.